We do full submersion rug washing on rugs from around the world. This method is not to be confused with hot water extraction(carpet cleaners technique). 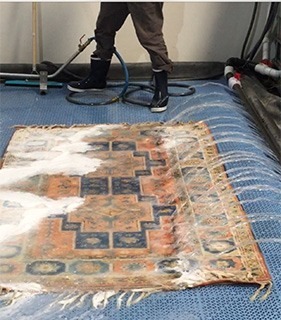 Make sure if you have a carpet cleaning company pick up your rugs for cleaning that they are taking them to a full submersion rug plant and are not cleaning the rugs themselves. Carpet cleaning chemicals and equipment should never be used on wool or silk rugs. (pics of rug with bleeds of red from carpet cleaners). We have a lot of rugs come into our shop with severe damage from carpet cleaners. These repairs if possible are very expensive and best avoided by selecting the right company to care for your rugs.